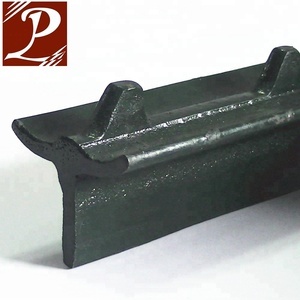 They are made of steel and are sometimes manufactured using durable rail steel. The posts are driven into the ground with a manual or pneumatic post pounder. 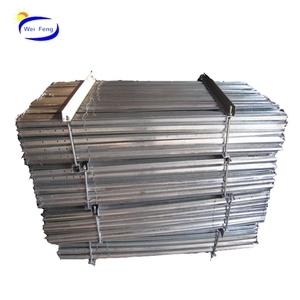 We are a manufacturer specialized in producing metal wire kennels and metal wire mesh fence. 4. We have in good faith; abide by the contract, deliver the goods on time. Q: How long is your delivery time9 A: Generally it is 5-10 days if the goods are in stock. or it is 15-20 days if the goods are not in stock, it is according to quantity. 3 YRS Anping Huawo Metal Wire Mesh Products Co., Ltd. 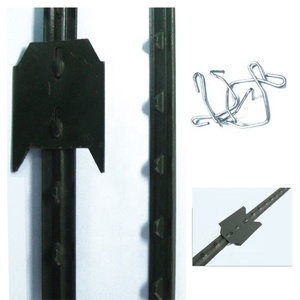 Product Name: Y Fence Post Material: Steel Length: 1.35m, 1.5m, 1.65m, 1.8m, 2.4m,etc. Surface Treatment: Painted, hot dipped galvanized, no paint. Detailed Images Packing & Delivery Packing: 400pcs/pallet Delivery: Within 15 days after the payment was received. 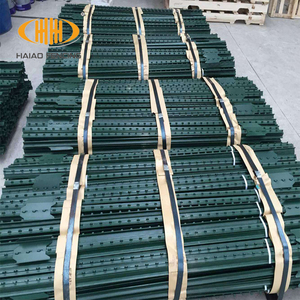 very popular on promotion steel fence post prices Product details ( we can do as your requirement ) Material: high qualtiy steel rail Post Thickness: 1mm, 1.2mm, 1.5mm ,1.8mm, 2.0mm, 2.5mm, etc Post Size: 40*60mm, 50*50mm, 60*60mm, 60*80mm, 80*80mm, etc Post Height: usually higher 50cm than the panel Surface Treatment: Electric galvanized Galvanized +PVC coated / painted Hot-dipped galvanized Hot-dipped galvanized+PVC coated / painted Post Applications: 1. Posts for protective wire mesh fencing of expressway & railway; 2. 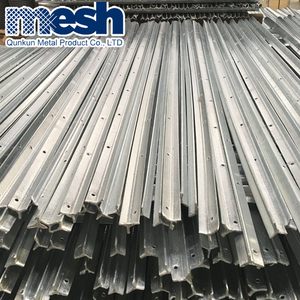 Wire mesh fence posts for security fencings of beach farm, fish farm and salt farm; 3. 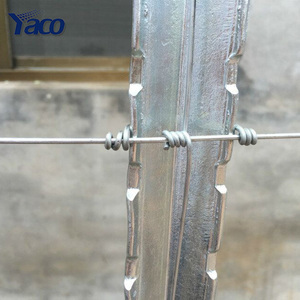 Wire mesh fence posts for security of forest and forest source protection; 4.Fencing posts for gardens, road and houses. Thanks for your attention on us. If you are interested in any of our products, Please feel free to contact me. 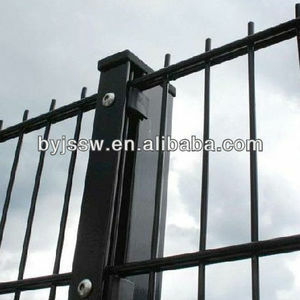 Alibaba.com offers 4,816 steel fence post prices products. About 57% of these are fencing, trellis & gates, 8% are steel pipes. A wide variety of steel fence post prices options are available to you, such as metal, plastic, and stone. You can also choose from steel, iron, and cast iron. As well as from pe, poly, and pvc. And whether steel fence post prices is free samples, or paid samples. 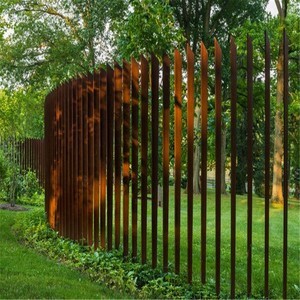 There are 4,816 steel fence post prices suppliers, mainly located in Asia. 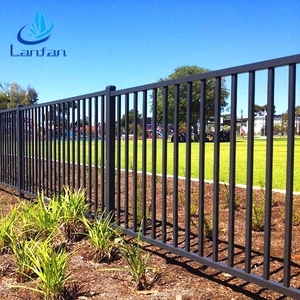 The top supplying country is China (Mainland), which supply 100% of steel fence post prices respectively. 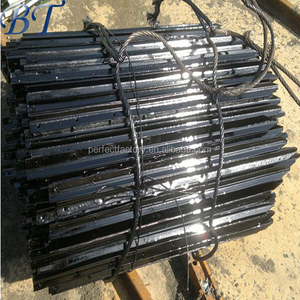 Steel fence post prices products are most popular in North America, Oceania, and Mid East. You can ensure product safety by selecting from certified suppliers, including 1,438 with ISO9001, 760 with Other, and 345 with ISO14001 certification.